£100 security deposit, which will be returned in full within 1 weeks of holiday ending, after caravan checks have been carried out and I am satisfied all is well. 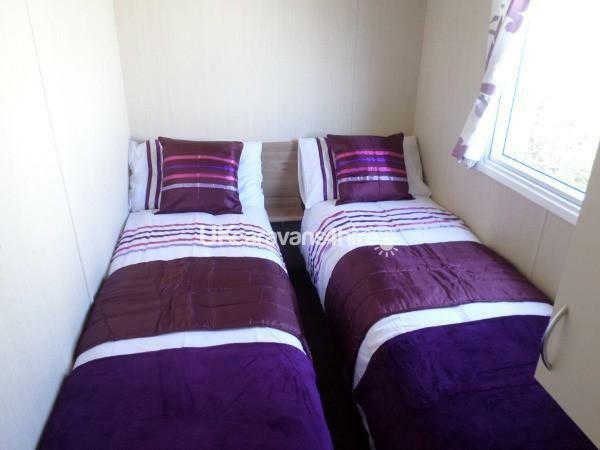 A Deluxe 3 bedroomed caravan for hire in Thorpe Park, Cleethorpes. Wall heaters in all 3 bedrooms and gas fire in lounge. All required beds made up for arrival. 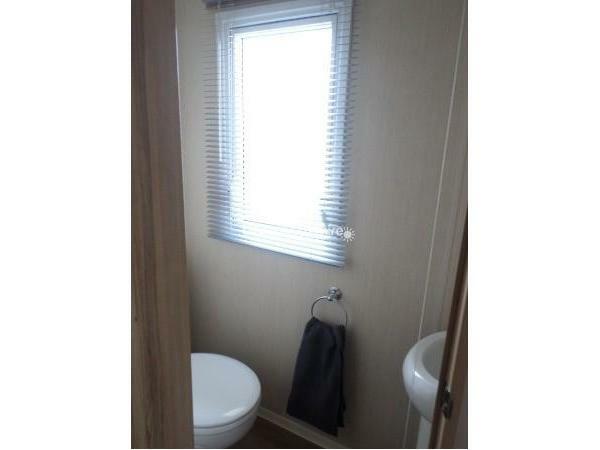 Shower room with toilet, sink ,heated towel rail and hand towel. A second toilet room and sink with hand towel. 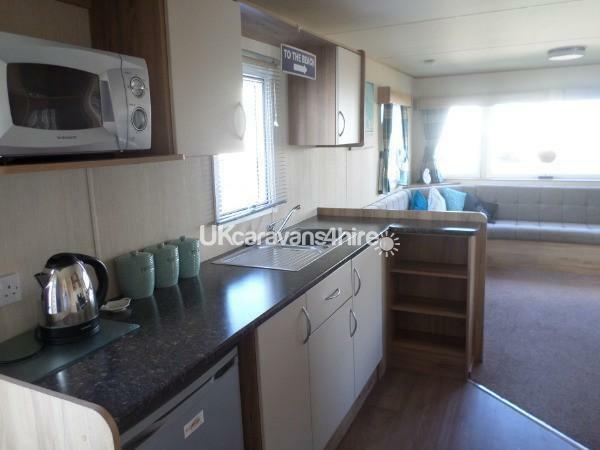 Caravan contains flat screen TV, DVD player and a great selection of DVD discs, games and books. 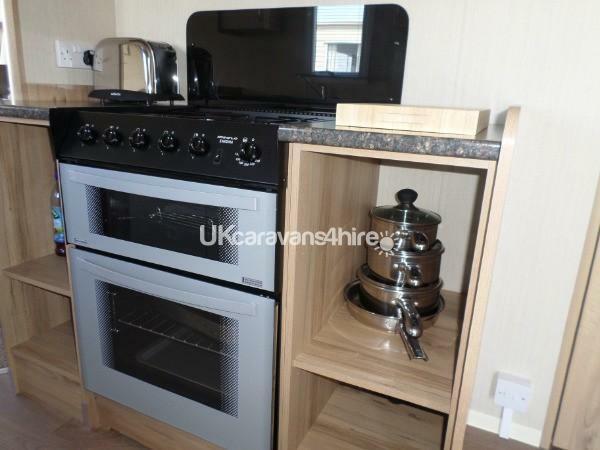 full gas cooker, microwave, kettle, toaster, hairdryer, iron and ironing board. My prices include bedding and towels. Beds will made up for your arrival. Well behaved pets are considered for an extra charge and asked not to be permitted in any bedroom or on the furniture. Any evidence will result in the loss of your security deposit. As a non-smoking caravan, if there is any evidence of smoking inside, (the smell of cigarettes/cigars, stubs, ash, burns etc..) will result in the loss of your security deposit. Please note entertainment/activity passes are NOT included. This means the swimming pool,amusements,kids clubs cannot be accessed. Passes can be purchased from Thorpe Park reception for 3/4 night breaks and 5/7 night breaks. Full inventory is kept and checked after every letting. I have recently purchased the caravan next door to this one. A newer model with no balcony. Same spec and price. 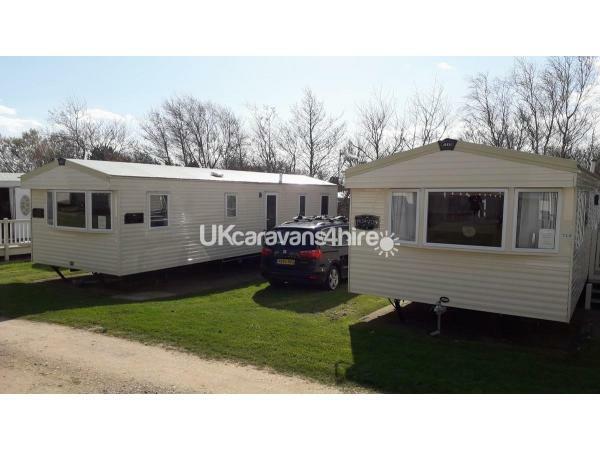 I will offer a 10% discount if both caravans are booked out by the same party. Have stayed in Caravan before (see 16th May 2016 above) and although it has changed hands since then it was just as good. Please read my review above because it is mainly what I would write again here. The Wi Fi sadly is not available any more but was able to use my Mobile as a Hot Spot but that did turn out very expensive - but if you are not a big user or just want to surf now and again just pop to Bar on Complex or McDs or similar. The Caravan would benefit from WiFi but as I knew it was not there this time it is not a criticism of the Property itself The Caravan was spotless and ready to go as soon and soon as we opened the door we felt at home (it was our third or fourth visit) and there was everything you would need to self cater without any problems at all - although we took the easy route eating out mostly with Sandwiches and Salads etc in the evening (simples) My Dog now 15 still enjoyed all the walks albeit shorter than we used to do and it is in an A1 position for that - active dogs can go for miles with walks from the door in almost any direction Loved it so much and my only disappointment was I was too late to buy the Caravan just in front as we love the position so much - and had I done so I would have been writing this review in there rather than at home ! Thank you for choosing Natalie's Caravan Breaks. You are welcome back anytime! Found the caravan by fluke, are we glad we did. Can not rate Natalie highly enough. So easy to book, fab communication. 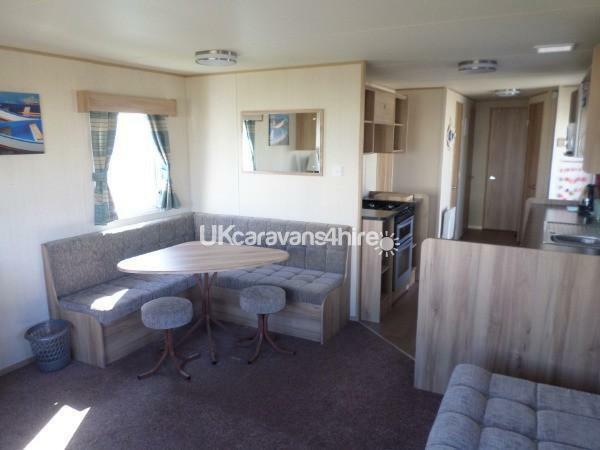 The caravan its self is fantastic, very clean, classy and perfect in every way. Could not find one fault. The location is ideal, close to the beach and very quiet. We had a fantastic weekend and will 100% use again and recommend to all. THANK YOU Natalie!! Stayed with my mum and enjoyed a lovely weekend in this beautiful caravan - exactly as described and couldn't fault it. Prime spot near the beach, great for dog walks and had everything you need. Great communication with the owner too. Will definitely book again. Thank you Natalie. 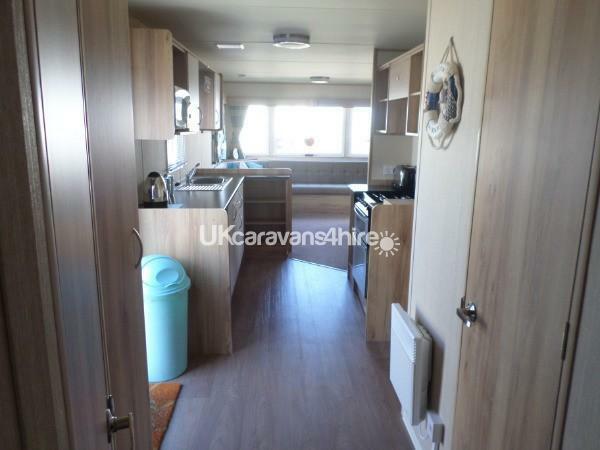 A beautiful caravan, very clean and well looked after. Right next to the beach. Nice and quiet, great walks for dogs, lovely to have bed made up and table set on our arrival. will recommend to family, looking forwards to going again. owner very helpful . 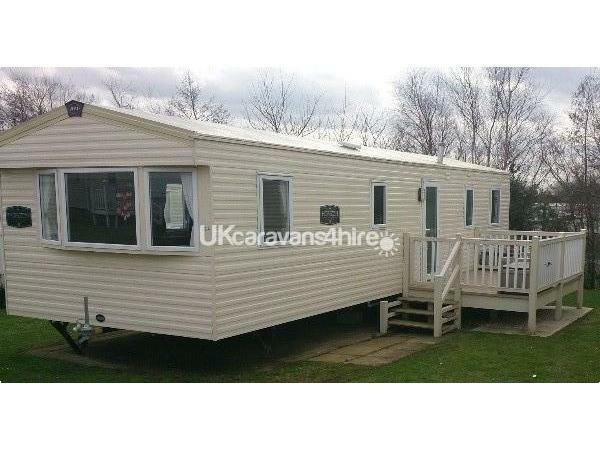 Absolutely lovely caravan with everything you could possibly need! Great location near the seafront and only a few minutes walk to to entertainment complex. Our boys loved being able to play on the grassy area where we could easily keep an eye on them. Nice safe veranda meant the little ones could play outside too. Great communication from the owner. Thankyou again! Great location, quiet but near to walks and train service into Cleethorpes. Everything just as described in the advert. Only fault was the gas fire which we needed after getting caught in a rainstorm, but we were unable to light it. I think it needs attention. 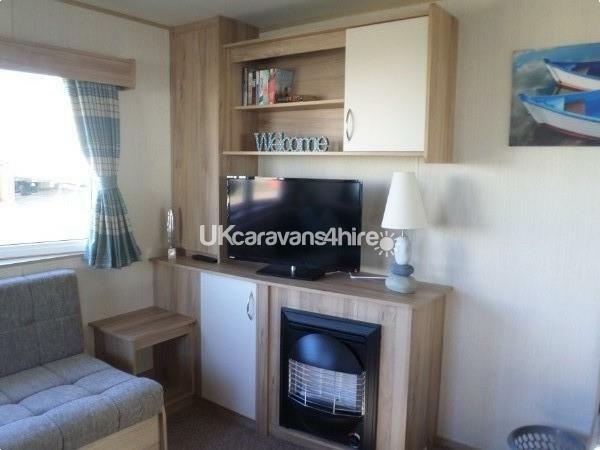 Well equipped caravan and very good TV for the evenings. Our retired greyhound really enjoyed her very first holiday. I'm sure we will be back again soon. Thank you Natalie. Hi, Thank you for your kind words. We did check the fire and it lit straight away . I am sorry you couldn't light it. We would welcome you back anytime.Regards, Natalie. Had a wonderful break. 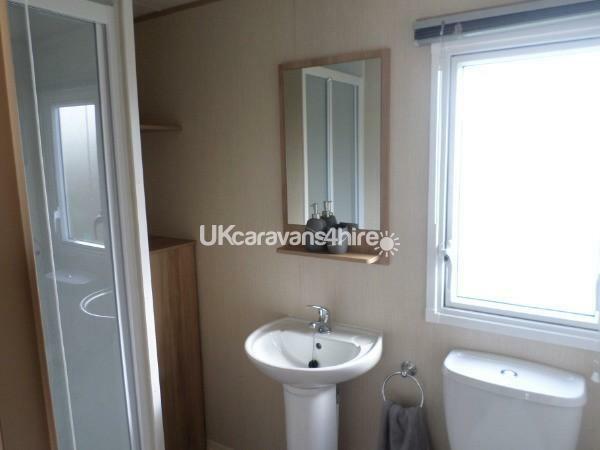 The caravan has little touches to make it lovely and homely with everything we needed. Made life a bit easier with towels included! Also heating was great as the weather was a bit on the cool side. 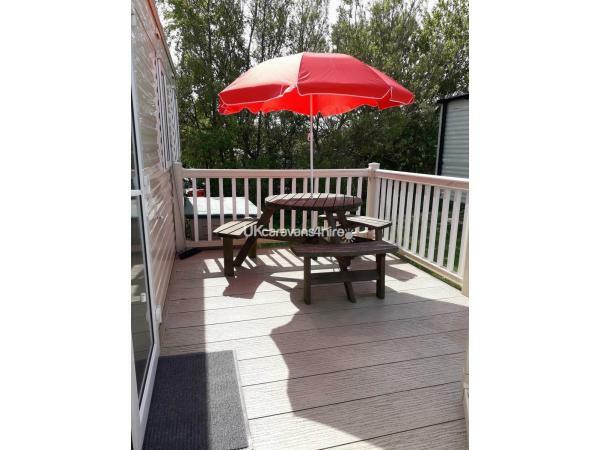 Situated in a nice peaceful spot with a side decking area. Ideal for walks and perfect for train station into Cleethorpes. Would definitely stay again.! Myself and adult daughter plus dog stayed here this Easter. I am quite fussy as, until recently, I have owned my own luxury caravan but honestly can't fault anything here. 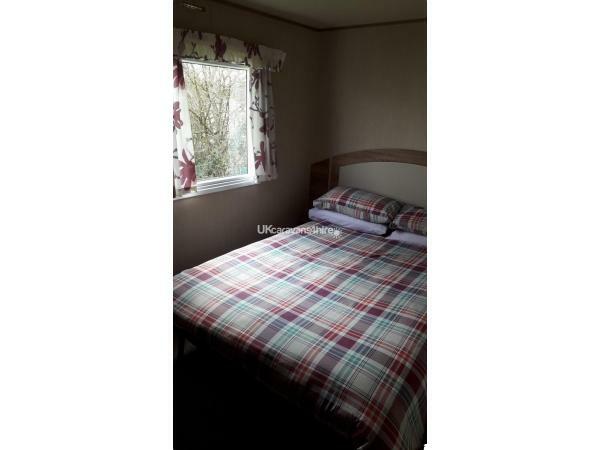 Superb location, beautifully clean and well equipped caravan, warm and cosy on arrival on a wet day! So nice to have linen AND towels provided. We enjoyed it so much we have already booked for Easter 2017 - says it all really. Owner really helpful. Just had a lovely weekend stay, caravan was spotless and a perfect location, nice and quiet and next to the beach. I highly recommend this caravan it was nice to have all the towels and bed linen provided and all the little extras that make it home from home. Would definitely stay here again and will recommend it to all my friends and family.